Right. You can buy discounted tickets for one item at a time. 1 for $10. 3 for $25. 5 for $50. You can buy more than 5 tickets as well. You can buy 25 or more tickets. I went for the HH. I'd love to have a sealed copy to leave in storage for 5-10 years. I went in for $25 (3 tix) because it's a super good cause. I attended Catholic high school and it really helped with getting me into college 2 decades ago. I will support this good cause as well and buy 1 ticket for each of the lots, i.e. $50 worth of support. Picked up 3 tickets, hope you they meet there goal. This is a great way to get some people who might not typically get involved to step in. I am hoping that a good portion of our 50,000 members will chip in a few dollars to help keep some people employed and some kids in a quality learning environment, plus have a chance to win some great sets. Bought 1 ticket in each raffle. Money well spent on a worthy cause close to the hearts of the guys who give us so much for free on this website. Thanks for doing this Ed. This is a great idea and we already got tickets. 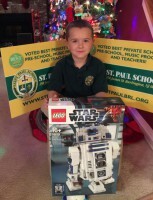 I also have kids in St. Paul in 2nd and 4th grade, and we love Lego! I have wanted the Death Star for so long I can no longer remember since when. I'm going to post you page daily on my Facebook and Twitter accounts. Good luck to all of us. Donation made. Good luck St. Paul. Good luck to St. Paul, the children, and the educators. Thank you for all that you do for us Ed and Jeff! I bought tickets for all of them even tho I never win raffles. You are a winner in my book for giving it a shot! Good luck with this special cause! Thanks...Just remember one thing. That is a 71001-18 Series 10 Collectible Minifigures SEALED case. They sell for more than $600.00 on LEGO secondary markets and you have the chance of winning a 1 in 5000 MR.GOLD, which is selling for over $1000.00 itself. That might be the most valuable item of the bunch. I would have thought this would have blown past 100 members in hours not a day. I know people are busy with the holidays, but for a website that is this active it better be at 1000+ by the end of the year. I will be buying more tickets. Always willing to help when it comes to education for kids, hope you reach your goal! Happy to contribute to a great cause. I attended a Catholic grade school and it is also struggling with enrollment. I wish St. Paul all the best! I hope you achieve your goal. Yes, I would be willing to pay for shipping on the sets and would put together some cool and creative package deals if members were willing to donate sets. That would be a great way to help as well. One member (I will keep them anonymous unless they want me to post their name) offered a new CITY train set for a signed copy of our book and I gladly agreed.